You can enhance your prodution output, analysis and visual experience by installing a Visualisation Pack specific to your Country. Visualisation packs may include comprehensive sign catalogues, enhanced block outputs for signs, line marking standards, additonal visualisation objects and sight distance criteria, and more. After downloading and installing your visualisation pack, run the installer to add to Civil Site Design. Civil Site Design V18.211 is now available for download via the Civil Survey Solutions Subscription Portal. For existing customers, a direct link to download will also be available from the Welcome Screen. This is a critical update for all Civil Site Design V18.21 customers to address a problem with editing drawings not associated with a Civil Site Design project. In Model Viewer, you can now generate linework for the intercept between two surfaces. The software will join continuous linework together and output as 2D and/or 3D polyline/s in the drawing. A new Surface Boundary command has been added, allowing for the polyline extraction of the boundary triangulation of any CSD Surfaces. 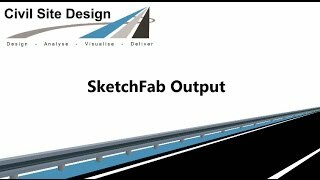 This greatly expands on your capacity to generate boundary linework, edit and re-use in other surfaces. Civil Site Design V19.01 is now available for download via the Civil Survey Solutions Subscription Portal. 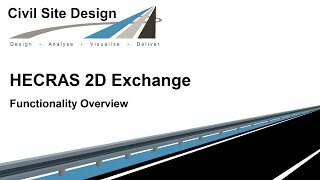 This release is specifically for Civil 3D 2019, AutoCAD 2019, AutoCAD Map 3D 2019 and other AutoCAD 2019 derivatives. This build replicates the functionality of the currrent commercial release, Civil Site Design V18.211. This release is available to all current Subscription customers. All fixes and new features are as per version V18.211. For details see the readme. Civil Site Design V18.20 is now available for download via the Civil Survey Solutions Subscription Portal. For existing customers, a direct link to download will also be available from the Welcome Screen. This release is available to all current Subscription customers. A new license key is required for this installation. License activation has been simplified and now includes user license return functionality for standalone licenses (for the same license to be activated on another machine). If you have a network license, you will need to download and install the new network licensing system. The Surface Manager now includes buttons in the Boundaries tab to allow assignment of Boundaries from another Surface. This can be very useful with Model Builder models – using the Totalmodel boundary. The software collects the boundaries from the referred surface and adds them as ‘fuzzy’ boundaries to the current surface, with a small offset from the calculated boundary extents of the selected surface. A Description is added to automate the boundary usage. Removing the description will Disassociate the Surface boundary. During the creation and editing of an alignment, an arrow will be displayed on screen to show the direction of chainages. Command allows users to form and process a computational workflow. Create Road / Profile Strings and Resample Sections. New forms with Hover Graphics. Section widths can be edited on the main form. The boundary assigned via the Civil 3D Surfaces command has been enhanced. It will now better manage loops in the boundary (previously looping boundaries would not be added to Civil 3D and the surface output could fail). Users can reassign the C.L. code. When rendering with Model Viewer, this will allow the users to have complete custom rendering between object codes. For example, a basin could have C.L, C.L, C.L, - this code combination could occur on other grading objects. You can now replace C.L. with BSN (Basin) for custom rendering. A new pit library has been added to this installation but NOT applied to prevent overwriting of users customer pit types. Copy / paste the drPitFamiliesCapacity.dat and ALLthe .dwg files to your Common-10 folder and (if required) to the Advroads-10 folder on your project -data folder. When a network is first exported, the pit loss factors (Ku) are assigned from Civil Site Design network analysis methods. Following this, re-export to DRAINS will not change the (Ku) – it will re-use the DRAINS import values for re-export. Allows quick Pipe Network deletion via a form instead of selection in drawing. Command line only. The interface of the enquiry tool has been updated. Civil Site Design V18.01 is now available for download via the Civil Survey Solutions Subscription Portal. For existing customers, a direct link to download will also be available from the Welcome Screen. This is primarily a maintenance release addressing issues raised by customers and identified through internal testing. One critical fix is with respect to Drainage calculations. The software was overcalculating catchment and pipe flows, pending catchment input method. For details see the readme. We are now making better use of the graphics card resulting in enhanced rendering in Model Viewer and better performance in Model Viewer, all Vertical Grading Editor windows and Cross Section windows. Text now includes anti-aliasing. Civil Site Design V18.00 is now available for download via the Civil Survey Solutions Subscription Portal. For existing customers, a direct link to download will also be available from the Welcome Screen. Includes a new Projection List method for choosing a coordinate system (this is required when obtain imagery or terrain data). Users just pick the category and the System to apply, instead of having to obtain a .prj file. New File > Save option in the Toggle Display form. This allows saving the display state of surfaces and reloading at any time. Section Manager (used by Cross Section plotting currently) now supports the inclusion of Add Extra Sampling sections. You can now import and support the ARR 2016 IFD Rainfall Data (Rational Method design). The Import ARR 2016 IFD command allows users to select a downloaded .csv file from the Buerea of Meteorology website. We have a DRAINS Overflows command allowing for assignment of DRAINS overflow templates per pit bypass, selection of a polyline to define the overflow length and slope to DRAINS and assignment of a percentage of the catchment to the overflow route. 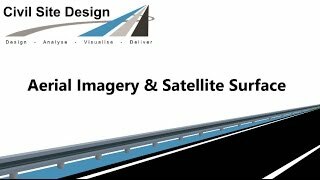 Civil Site Design V17.014 is now available for download via the Civil Survey Solutions Subscription Portal. For existing customers, a direct link to download will also be available from the Welcome Screen. This release focus was on addressing issues raised by customers and identified through internal testing. For details see the readme. Civil Site Design V17.01 is now available for download via the Civil Survey Solutions Subscription Portal. We are still working on the BricsCAD V17 platform release with Bricsys, the developers of BricsCAD. We hope to be releasing on this platform soon. Grip-editable alignment geometry when the Edit Alignment dialog is displayed. A directional arrow is displayed on the grading polyline to clearly indicate the polyline direction. Added commands to reverse, move, and select the grading object. The Superelevation Editor form has been revamped and includes the option to load and save styles. The Section Manager form (used when plotting cross sections) has been revamped and also includes additional sampling options. Grip editable IP's in the Vertical Grading Editor. GENIO Export command has been updated. Satellite from Surface command allows users to create a CSD Surface using online elevation data. Image from Satellite command allows users to download aerial imagery directly into their project. New export/import commands to interface to Hec-Ras 5 for 2d modelling analysis. Improved line-marking tools. Users can now add line marking by referencing polylines from CAD. Two-point slope tools allowing users to reference line entities from CAD. Export to OBJ file allows users to import their design to programs like Blender for hi-res rendering. Added reporting tools include Areas report, Objects report, and Line-marking report. CAD Output command allows data from Model Vewer such as sight distance and line marking lines to be outputted to CAD. Tooltips added, which show design information such as level difference and road crossfall. The SketchFAB viewer below is of a customer dataset, which showcases the new line-marking design tools in Civil Site Design. We believe that SketchFAB will become a great tool for users for sharing their designs with others. Civil Site Design V17.00 is now available for download via the Civil Survey Solutions Subscription Portal. You can now add mass planting of trees and other features as 'cut outs' - these are light weight and give a powerful visual enhancement to your models. You can add cut-outs over an area, at a single point or along a polyline. After you set width and height, surface and image to use, the cut-out is created. Linemarking has been introduced in this version. Create linemarking standards and apply them along any alignment, over chainage ranges of your choosing. You can also create linemarking at an offset, so it's easy to create stop, give way and other offset linemarkng. Area linemarking can be used to render any part of your surface with another material - pick a closed polyline in the drawing and assign a 'linemarking' style to set a material. Create/Edit Templates has new images that update as you hover over inputs, making it easy to understand the impact of different inputs. We have also introduced a new method for managing chainages to use in your outputs, starting with cross secton plotting - you can now apply named chaiange lists for your cross section outputs, with tick box options to automatically include/exclude horizontal geometry points, vertical geometry points, superelevatoin and more. For AutoCAD and BricsCAD customers, we have included a Create Surface create button on the surface volume command, so you can now apply cut/fill shading, cut fill contours and add surface labels to a volume surface. Civil Site Design V16.1 is now available for download via the Civil Survey Solutions Subscription Portal! This release is jam-packed with plenty of new exciting tools such as Model Viewer and a new cross section plotting engine. In Civil Site Design V16.1, you can fully realise your design in a rendered 3D model - updating as design changes are made and incorporating site distance analysis. In addition, this new release includes significant improvements to plan production outputs, multi user design project collaboration, software update notification via a welcome screen and more. - Output screenshots and generate fly overs based on selected views. To learn more about Model Viewer, please check out this video playlist. 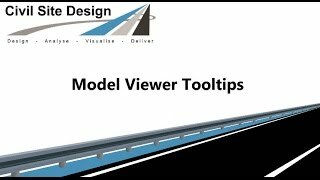 We have complied 13 videos, which explain how to use and setup Model Viewer for your design projects. There is a new Cross Section Plotting routine, accompanied by functionality known as object ‘tagging’. You can stay old school - Access to the current plot engine is still available. Your ‘old’ plots should open in the new plot engine (check carefully though because some functionality differs). - Report offsets of any objects on selected layer/s in a band. Objects can also be ‘tagged’ with a name (see below). - Plot any surface (from Civil 3D or Civil Site Design) and intelligently filter the triangles. Filter based on grade break, height difference, offset or chord height difference. - Don’t settle for a single line and ‘top left’ centred text – apply Label Styles for the bands. Justify the text where you want in the band, use ticks instead of lines and add blocks in the band. - The old layer list is gone – work natively with the layers you have created in the drawing. Users to have the ability to set the display frequency of the Welcome Screen. With the new Data Sharing tools you can now do more for data collaboration, based on spatial location (eg: Stage 1, Stage 2) and by industry (eg: Surface creation from surveyors, lot regrading and general earthworks, road designs, drainage and sewer). - Data share to a centralised folder or from the source data directory. - Read in data to obtain full object control (minus editing) in a read only format. Advanced Road Design V16.01 has now been released. Advanced Road Design V16.01 has been created to operate on AutoCAD and AutoCAD Civil 3D (Versions 2016 to 2012), as well as BricsCAD V15, and includes all fixes and enhancements from previous versions. Advanced Road Design V16.00 has now been released. Advanced Road Design V16.00 has been created to operate on AutoCAD and AutoCAD Civil 3D (Versions 2016 to 2012), as well as BricsCAD V15, and includes all fixes and enhancements from previous versions. Additionally, changes have been made to the licensing system to remove obstacles with obtaining licenses using the online licensing system, when proxy servers were involved. A highlight of key new features is below. You can now plot all your strings at the click of a button. Establish default settings controls to apply for new Strings, set whether to plot to file or to layout, and manage plot layout tab names. Volume reports have been completely revamped. You can now view volume outputs of any strings in an interactive form, control what columns display and output to .csv file (opening automtiacally to Excel) or to a table in the drawing. Advanced Road Design V15.02 has now been released for AutoCAD Civil 3D (Versions 2012 to 2015), and includes all fixes and enhancements from previous versions. Numerous improvements have been made to address customer reported issues, including problems with plotting long sections. House Connection Counter. Counts the number of house connections attached to a drainage/sewer network. Advanced Road Design V15.01 has now been released. Advanced Road Design V15.01 has been created to operate on AutoCAD Civil 3D (Versions 2011 to 2015), and includes all fixes and enhancements from previous versions. The Active Drawing Settings or Global Drawing Settings forms will now open faster. This new form opening approach will be implemented on other slow-opening forms in future updates. If you have Civil 3D 2015, Advanced Road Design V15 is enabled to operate in that platform. Adding an 'R-' in the Alignment Description is no longer a requirement when creating a road object. If the Create/Edit Road command is used, than the software will assume a road object is being created. If the Create String/Profile command is used, than the software will default to creating a string object. This command was created to replace the Multi Section Batters command and allows for the designer to create more powerful conditional based sections or batters. Users now have the ability to perform 'end depth checks' and have more control over how the depth check is calculated. The Grid Editor allows users to add and edit their vertical IPs in a grid format. When the Grid Editor is loaded, all IP's will be displayed. These IP's can be edited in the grid editor and the edit is instantly applied to the road or string. The user can override the chainage, level, and VC length and also quickly assign an elevation or grade difference between IP's. One great feature of this command is the ability to apply a horizontal shift to the vertical design.